Super Cool Products For Your Best Friend! We're determined to create a world of the coolest, driest, cleanest, and happiest pet homes, ever! For far too long, dogs, cats, and horses have suffered from the hot sun, been dried off with horrible towels that get too wet, and been been blamed for spills, accidents, and loose pet hair. Introducing the Clean Pets USA 'Best Friends Selection'. Products Include: Cool 'N Dry PVA Pet Shammy and Absorb 'N Dry PVA Pet Sponge. Prices shown below are suggested retail prices in U.S. Dollars. 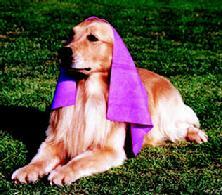 Cool 'N Dry for Pets is an extremely durable and hydrophilic sponge polymer towel. It literally loves water! Used wet, it cools your pet on a hot day or dries them off after a bath or sudden shower. Cool 'N Dry has a dimple texture on one side (for cooling) and a smooth surface on the reverse side (for drying). When Your Pet's Hot ... It Cools: On hot days, the Cool 'N Dry will keep your pet cool. Simply wet and drape over your dog, horse, or pet. Or, use it as a cooling mat. Use during or after walks, competitive events, or if your pet has a fever. When Your Pet's Wet ... 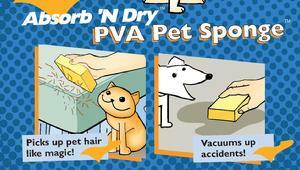 It Dries: It will dry your pet completely in just a matter of seconds. And, it doesn't drip. Use after baths, rain, or snow showers, or any time your pet gets wet. Great for cleaning paw prints off the kitchen floor. The towel has a reinforced center mesh which prevents the polymer material from ripping or tearing. It can be cut with scissors to the desired size. The material can also be sewn to make pet vests for better fit and comfort. Available with convenient storage tube or flat-packed for groomers and veterinarians. Cool 'N Dry for Pets is machine washable and lasts for years. 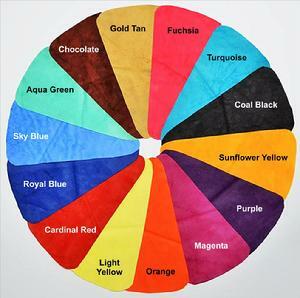 Available in 14 cool colors: Sky blue, royal blue, aqua green, turquoise, sunflower yellow, light yellow, fuchsia (dark pink), orange, purple (grape), magenta, cardinal red, gold tan, chocolate, and coal black. Available in two handy sizes! * Large size: 17" x 27"
With handy storage tube - Suggested retail price: $19.95 each. NOW: $14.95 each! Flat-packed (no tube - bagged) - Suggested retail price: $18.95 each. NOW: $13.95 each! * Small size: 13" x 17"
With handy storage tube - Suggested retail price: $14.95 each. NOW: $11.95 each! Flat-packed (no tube - bagged) - Suggested retail price: $13.95 each. NOW: $10.95 each! Great for Cooling Your Dog or Pet in Hot Summer Weather! Forget using the Sham Wow! cloth material. The Absorb 'N Dry� PVA sponge block is a highly absorbent sponge with a very smooth surface (130 micron pore size). Depress sponge in liquid, release to vacuum up to 8 - 10 ounces of spilled liquid - without dripping!! Great for spills in the kitchen, on carpet, or defrosting the fridge or freezer. Try this application: Saturate the Absorb 'N Dry block with fresh water (squeeze out excess). Place it in your refrigerator on the middle shelf. The Absorb 'N Dry block will absorb odors and hydrate the refrigerator. When it becomes dry, wash with soap in a sink or with your normal laundry, re-wet, and place again in your refrigerator. It does the same as baking soda - without the mess - and can be used again and again and again! This sponge is also called "the marathon sponge." You probably saw it at the Olympic Games in Beijing where marathon runners used them during the race in order to stay hydrated and cool. Durable, lasts almost forever, wash n' reuse. The Absorb 'N Dry PVA Vacuum Sponge Block was previously marketed as Slurpex in the USA, Europe, and Australia! Note: Current product is white in color for both sizes.